I don’t venture into baking and dessert making that often, but when I received a copy of Whole Grain Vegan Baking by Celine Steen and Tamasin Noyes to review on the blog, it served as a good reminder that I should change that. After initially flipping through WGVB, I instantly spotted their trademark style of approachable recipes written in a clear, engaging and fun way and, after a more thorough read, was inspired to roll up my sleeves and get my hands dirty with the array of whole grains utilized throughout the book. When Celine and Tami get together to write a cookbook, it’s a given that the recipes are going to be amazing, easy and fun to make, and look dynamite on a plate. One of the first things I noticed in the book was the most obvious— Celine’s amazing photographs (about 45 of them)—which are all breathtaking, inspiring and showcase her rustic-yet-sophisticated style of photography. The next thing I was drawn to was the clear explanation of baking methods, flours and specific ingredients. Tami and Celine know their stuff, and clearly and generously want you to know about their stuff. So in addition to getting more than 100 recipes from breakfast to brunch, loaves and muffins, yeasted breads, “smarter” snacks and wholesome desserts to choose from, you’ll also get a complete rundown and description the whole grain flours used in the book, as well as several baking tips and tricks. your favorite whole grain that you like to bake with. Be sure to leave your email or some way to contact you in your comment in case you are chosen as the giveaway winner. Shipping is restricted to US and Canada only, and the winner will be announced on May 29 (I’ll use random.org to pick the winner) … good luck!UPDATE: The winner of the giveaway is Angry Asian, over at morestomach — congrats! Rich and creamy, this decadent tart could be served in a five-star vegan restaurant. With only 1/2 teaspoon oil per serving, this raspberry chocolate explosion lets you pamper yourself and your family without the guilt. Preheat the oven to 350°F (180°C, or gas mark 4). Lightly coat a 6 1/2-inch (16 cm) tart pan with cooking spray. Combine the oats, flour, cocoa, and espresso granules in a small bowl. Stir in the syrup, oil, and water. The mixture will be sticky and should hold its shape when pressed together. If not, add more water, 1 teaspoon at a time, until it does. Press the mixture evenly onto the sides and bottom of the tart pan. Dampening your hands with water may help reduce some of the sticking. Put the tart pan on a baking sheet. Bake the crust for 7 to 8 minutes, until the edges start to look dry. Let cool on a wire rack for 1 hour, or until completely cool. Combine the cashews, creamer, cocoa, jam, and maple syrup in a blender. Process until completely smooth. Spread the filling evenly in the prepared tart shell. Top with the raspberries, beginning at the outer edge of the tart and working in circles toward the center. Chill for 3 hours before serving. This recipe can also be made in three 4-inch (10 cm) tart pans. You may have a small amount of filling left over; it can be chilled and eaten as mousse. 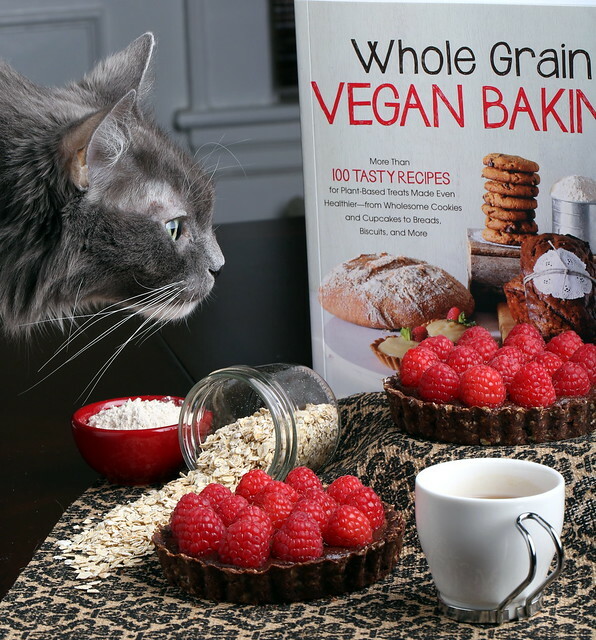 For more delicious Whole Grain Vegan Baking recipes, reviews or additional chances to win a copy of the book, be sure to check out these other fabulous bloggers who will be hosting them throughout this month! May 27: Don’t Eat Off the Sidewalk! I love breads with lots of seeds, like the Seeduction bread at Whole Foods. Yum! This book looks great. My fave bread is homemade Date Nut Bread. I've only just discovered buckwheat flour but I'd love to try using it for that yumful bread. Cheers! Boy, do I love pastry and bread. My favorite would be dark chocolate croissants. My favorite bread is struan, but it's quite a lot of work to make so I don't have it very often. Buckwheat is really fun to bake with. Thanks for reviewing the book! My latest favorite is Chocolate Zucchini Muffins from the Happy Herbivore! I would love to learn how to make vegan breads! I love a good vegan carrot cake! My favorite dessert is pineapple upside down cake. I have used lots of whole wheat in all my baking, but I'm just starting to experiment with spelt and garbanzo bean flour. My favorite dessert is chocolate upside down cake. So far my favorite whole grains to bake with are whole wheat flour, whole wheat pastry flour, and oats, but I think it would be fun to give chickpea flour a try. My favorite is Irish Brown Bread. My sister brings it over from Ireland a couple of time a year fresh from the bakery. As for desserts, I can't remember the name of the vegan bakery or its cookbook located in NYC, but they make a to die for Lemonade Tea Cake that if wonderful. since dairy does not agree with me i do veer away from the creamy stuff. i admit to missing desserts like tiramisu, FLAN, pot de creme and the like. sure there are times when i will indulge and suffer the consequences, and there are excellent alternatives out there that i'm learning about, which makes it fun. My favourite bread recipe is whole grain French bread. Delicious! I've been told it's as good as French bread from a bakery. Although I don't bake with it often, I love kamut. Those big plump grains are just awesome in a creamy sauce. But for sweet treats, I love oats. I'm in a oat honeymoon phase right now. Seems like just the book to satisfy that craving! Naan is just delicious! But any kind of flatbread recipe I will try first! Is this open to overseas too? Hm, actually I eat little bread as I am both vegan and wheat/oat, mostly gluten free and it's impossible to find delicious vegan/gluten free treats here, that's why I want to win! Sorry, shipping is limited to US/Canada only, as described in the giveaway details above. My favorite bread is definitely a fresh whole-grain crusty bread…miammm !!! My favorite grain is buckwheat but I really like millet, kamut & quinoa too. My favorite dessert is a classic chocolate chip cookie with cold almond milk. I am not a very confident baker, and haven't played with whole grains. I'd love to dig into this book! Right now I'm loving banana bread with all fresh milled whole wheat flour. I mill my own, and am having fun making different flours. The taste and feel of freshly milled flour used immediately is divine! If only I could make a whole grain baguette with a multi-grain mix sprinkled on top. But what if a vegan, whole grain angel food cake were possible???? I love banana or cinnamon raisin bread 🙂 Mmmmmm! This giveaway is fantastic. The recipes sound amazing! I love chocolate chip cookies made with whole wheat flour. I would love to experiment with more whole grains!! my favorite baked good is banana bread with cacao nibs and almonds. My favorite grain to bake with? OATS! Mmm I love fresh raspberries! Looks lovely! A favourite dessert of mine are the cinnacrunch muffins from Tami's first book, American Vegan Kitchen. Oreo cake or pie would have to be my favorite! I love Ciabbatta bread and am always looking for a good cake recipe for high altitude as I live in Colorado. 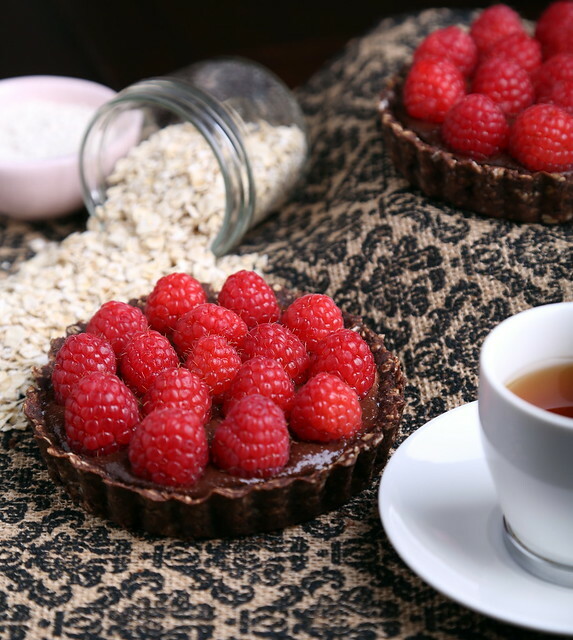 Ummm…I think this Chocolate Raspberry Tart is going to become my favorite dessert! And the Pesto Knots…yes, please!! I haven't gone too far into whole grain baking, so I'd have to say that wheat is my favorite! I love using buckwheat flour; also, I've recently bought millet flour and I have a feeling it's going to be a new favorite. I have been looking forward to this cookbook because I always have to alter recipes to make them 100% whole grain. I like using whole wheat pastry flour, oat flour (freshly ground), and spelt flour. I've also been experimenting with garbanzo bean flour and brown rice flour. My favorite dessert is tiramisu–but I'm very picky about my tiramisu 🙂 Is there a tiramisu recipe in this book? I've been looking for a chocolate tart recipe for a long time – I'm really excited to try this one! My favorite things to bake are pies. I love incorporating fresh fruit into my desserts. But I'm sure I'd love any and all of the recipes in the book! Orange cranberry muffins, with walnuts or pecans for added crunch, are my go to baked goodies. Made with my fav grain, whole wheat pastry flour. I love fruit crisps with lots of whole grains in the crumbly topping! My favorite dessert is actually bread pudding! I have yet to find an amazing recipe for vegan bread pudding, but here's hoping to find one soon! Also, I would really love to bake with corn flour more often! I love pumpkin chocolate chip bread. My favorite whole grain to bake with is spelt flour. Brownies, but really anything chocolate! And in my house, it's with whole wheat or white whole wheat flour! I like a rich decadent cheesecake..maybe dark chocolate with raspberries. Quinoa — I love Black Bean, Sweet Potato, and Red Quinoa Soup. So yummy! My favorite dessert was strawberry cream pie, which I yet have to see veganised and my favorite bread is danish rye bread which has several grains in it – I'm one for the more the better in that perticular case, and would love to own this book. I'm a fan of banana bread. I make an awesome chocolate banana bread that is vegan. I typically just use whole grain wheat flour. But sometimes I like to make oat flour. My daughter gave me a great recipe for a vegan chocolate cake and even though I am not a vegan this is the only recipe I ever use for chocolate cake. I like baking with spelt flour and white whole wheat flour. my favorite bread is sourdough, but I haven't tried to bake my own yet. Thanks for a chance to win what looks like a great cookbook! i love to bake anything and everything. some of my faves include pizza and brownies. in terms of grain, the most fun to work with was amaranth. i popped it and added it a vegan peanut butter cup recipe for added crunchiness. SO good! Favorite Dessert: depends on my mood. Right now it is brownies! Favorite homemade bread: does pizza crust count? Grain: i play around with them, but i am all for subbing whole grain for white flour, at least 50%. i generally get great results! My favorite dessert is anything with marzipan or almond paste and my favorite kind of bread is sourdough. Thank you for doing this giveaway! My email address is galiaozari@yahoo.com. Just discovered your blog and man does it look yummy! I love, love, love crusty breads especially sourdough and rye. But those raspberry tarts look lovely and they will be happening at my next dinner party. Favorite desert is apple crisp. any kind of chocolate tart would be my favorite dessert and i've been trying to cook with quinoa flour or chickpea flour recently! I love vegan creme brulee! As for bread I love it all! Beautiful blog, love the pictures! it's great to see great photography and great vegan cooking combined! I love fruity, summery cakes! Add berries or peaches to just about anything baked, and I'm in. those tarts look so pretty! hmm right now i love baking regular baked goods with whole grain spelt and breads with dark rye! and current fave dessert.. sticky cinnamon rolls! Lately, I've been making cashew-based mousse pies similar to this one. My favorite whole grain for baking is whole wheat pastry flour (not that original, I know). Need. Bread. Pudding. I hope there is a great recipe in the book! If not, that's ok… still want the book! My favorite dessert bread is lemon poppy loaf but I've never attempted it in whole grain. I've never ventured beyond using whole wheat flour and spelt so I'd love to get my hands on this book for some new ideas. favorite dessert or bread: i love pumpkin bread! your favorite whole grain that you like to bake with: i love white whole wheat flour! Favorite dessert: cinnamon rolls and ice cream cookie sandwiches! Muffins! Loves to make 'em and share them. Fav whole grain = oatmeal. Looks lovely. I want it! Vegan cake with lots of frosting is a favorite dessert and I like to use whole wheat pastry flour. I love baking with oats- versatile and healthy! I love cinnamon raisin walnut bread! I love caramelized onion bread ad well as rye bread. They are both delicious fresh out of the oven! I looove pumpkin bread (with nuts and cherries)! I would say the grain is a tie between oats and spelt flour. I love a good crusty baguette dipped in herbed Spanish olive oil. Baking is not my strong suit, so I could really use this book. I really like to use kamut as it is an ancient grain that hasn't been modified or changed over the years. Yum, yum & yum! 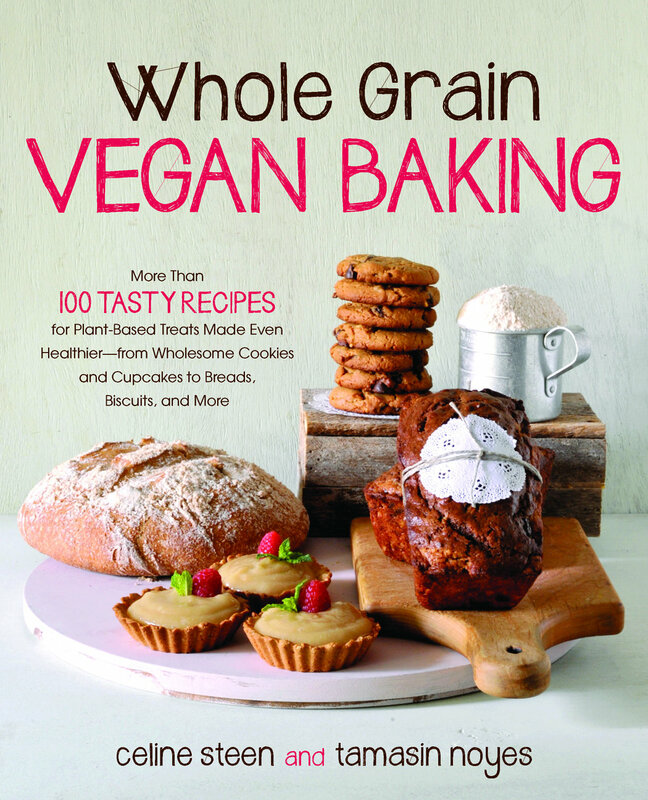 I love vegan baking & this book looks delicious! Oh dear, I didn't leave my contact info and I'm hoping to win. junky22@mac.com!